Today, that spotlight shines brightly on James Kennedy, who you’ll more wildly recognise by his alias of DarkNoise. DarkNoise: Thinking back, I’d have to say I was about 12 when I first got into Sonic. My parents bought me a Mega Drive for my birthday, which originally came with The Lion King, but my older brother bought bought himself a Mega Drive and it came with Sonic The Hedgehog and Sonic The Hedgehog 2, and from that moment I was hooked. I’m not entirly sure what it was that appealed to me, but I loved the game, I loved hedgehogs, probbably passed on from my nan who was an avid lover of hedgehogs, and my favorite colour back then was blue. It wasn’t any longer than about 2-3 months after my birthday that I accidentally discovered there was Sonic The Comic. The first ever issue I ever got was the first part of ‘Flickies Island’ (still sat on a shelf somewhere) so it must have been about 1995-1996 at the point. I really loved the colours and art style used in the comic, and I liked seeing all the other pictures everyone had mailed in. Everyone all my life had been a bit pushy, forever priasing what an artist I was, so I took to drawing Sonic alot and sent quite a few pictures into STC (never got one printed though, haha), used to draw alot of short little doodle comics in spare note books from school, etc etc. Somewhere around 1999-2001, I kinda dropped off Sonic art and went into a bit of a Pokemon faze, but then I arrived at college in 2001 and joined the Sonic community once they let me loose with the net there. By this time things had changed, and by things I mean Sonic. His design had changed, there were new characters, and everything, and I had to try and adapt to it all. I’ve been sketching ever since trying to perfect it over and over and over again. We’re now 10 years down the road from then, and my love of drawing Sonic has never stopped. If anything, it’s grown and expanded to more styles, and other characters. I love coming up with new things and new ideas, not only to show my love of Sonic, but also to show my own creativity and imagination. DN: Might be a bit tough, but here we go. 2001: This was the first ever picture I ever uploaded on to DeviantArt 10 years ago. It was drawn mostly out of boredom while I sat in my Graphic Design lessons listening to my tutor ramble on. 2003: Sonic Heroes had just come out and I thought Metal Sonic just looked badass, but there were alot of people complaining they couldn’t see his full form. I worked hard to find reference shots and piece it together. All these years later, I still got it wrong. Whoops! By this time, however, I had progressed to using Photoshop on the computer alot, as well as scanning work in. 2003-2004: A small collection of the very few pieces of that have survived these past years. Back then I did alot of pen and pencil work before scanning to PC. I was still trying to get to grips with designs and forms, but hands… UGH!! HANDS!! 2005: Still sticking with the classic Yuji Uekawa SA art style at this point, but still trying to nail down forms, poses, and hands. Backgrounds not a strong point. 2006: Went freestyling with a few pictures at this point, experimenting with art styles and composition, as well as attempting backgrounds. Hands… still no good at hands! 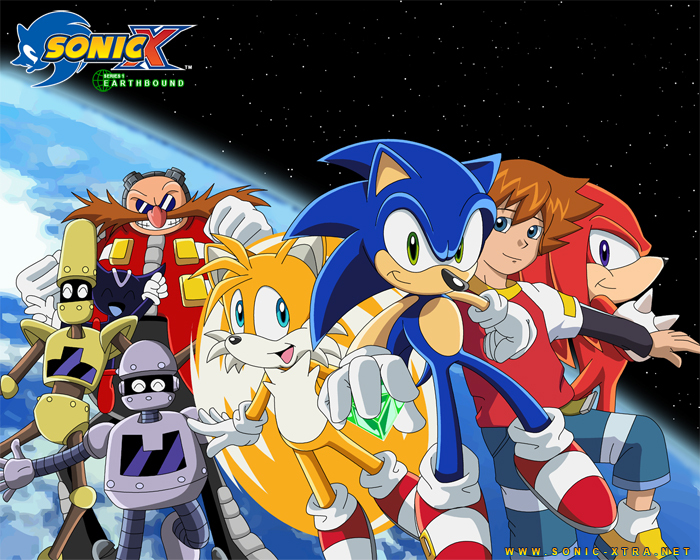 2007: Three years after the demise of SonicAnime.net, I was attempting to get a Sonic X site back up on it’s feet as SonicXtra. During that process I turned my work towards traditional cell shading and producing Sonic X themed images and wallpapers for the site from scratch. This was one of them. Ironically, the site is still yet to see the light of day! 2004-2008?? : At somepoint, I worked on Sonic The Comic – Online. This was my first (and last) ever strip for the comic, ‘Return to the Death Egg‘. I did do a few cover pieces and colour during my time on the comic however. 2011: My latest piece. I’ve moved on from pen and paper and begun using a Tablet PC with Alias Sketchbook Pro and SAI installed. It’s given me alot more freedom with my work and I strive ever more to produce more quality work rather then constently banging out one picture after another. Hands… I’ve finally begun to improve and understand hands after 10 years! DN: Well, if it’s ok, I have two favourite pieces and can’t decide between the two. This is a piece I did as a free art print for the very very first Summer of Sonic back in 2008. This was all sketched and inked on my Tablet PC before being moved over to my desktop for experimental colour rendering in Photoshop (with exceptiong to the background which was painted on the tablet). It was one of my proudest moments. I did this earlier this year and is a variation of the postcards I was handing out at this years Summer of Sonic. Once again it was sketched and inked on my Tablet PC, before being transferred to my Laptop for yet another experimental colour rendering. It took alot of hard work, and I was exceptionally pleased with the final outcome. DN: It was absolutly fantastic, if not a bit hot. I’ve been to every single SoS and they’ve all been fantastic, and this year was no exception. It was brilliant to meet up with all the STC-O crew, and catch up with Dean (Syaming-Li). Tracy Yardly, sat around all day sketching and even did a quick doodle for me which was great. He was a real trooper, grats to him. And of course, meeting Yuji Naka was just brilliant. But most of all, just seeing all the guys, catching up with a few people, etc. Just brilliant and can’t wait for next time. DN: For me I’d have to say when people come up to you. Once again this year, just like the last few years, I’ve had people come along who recognise me and just want to say thank you for the art prints I gave out in 2008. Many of them come up to me to let me know how they have it framed and hung up. It really does lift my spirits and make me feel good about my art to hear that. I have to say meeting Yuji Naka was defenetly right up there with that though. Such a pleasent chap, and a pleasure to meet him. DN: I’m not sure really. Alot of time I just pot around doing the usual daily stuff, playing games, watching tv, etc, and ideas just come to mind. I don’t perticularly have a thought pattern about it. It just kind of comes to me. DN:Well, I’m always keeping tabs on other artists, I’m always looking through design books, and such. Infact I have a few for things like Phantasy Star Online, Fullmetal Alchemist, and Mass Effect. They all have such gorgeous work in them. But theres also all the other artists out there who are always turning out a lot of brilliant work, and there are alot of times where I’ll be browsing around DA and I’ll see something and think ‘thats a good idea’ and alot of the time I end up being inspired by multiple items and decide to try and blend them. Well I’ve been working on a comic project for several years now, ‘Sonic Adventures‘, but it’s allways suffered setbacks such as equipment failures and illness. It’s also taken many many different forms and the entire layout, concept, and script for the comic has changed several times and no longer has any resemblence to what it originally was. Infact it’s no longer a comic. Due to work loads, the layout of the script, and the vast epic scale I’ve been wanting to portray, I’ve decided to work it as a Graphic Novel instead. This will give readers big chunks set into various chapters per novel and give breathing spare between novels to complete the work for the next one without having to commit to a weekly or montly timetable. The basic premise of the project though is that Sonic has been in hiding for some reason for quite a few months, and Eggman’s been missing since thier last encounter. From this we see Sonic come back in to play as small group of artificially enhanced troops start to abduct entire towns and villiges. However, Sonic isn’t his old self and seems to be a bit brooding and cynical sometimes, while he and his friends try to figure out whats going on. This is just the very start of it though. The whole plan in a continuing, ongoing, progressive story going from novel to novel, and there are plans for much grander stories ahead. The idea for this was to give Sonic and everyone else some character development rather than having Sonic constently the happy go lucky, speed everywhere, and allways look on the bright side, kinda guy. I wanted to write more of a background and give him more depth. At the same time I wanted to try and see how things would turn out if I could merge all the various universes into onew new original one. Basicly think Tsubasa Chronicles, but with the Sonic franchise. As well as Sonic Adventures, I have also rejoined Sonic The Comic – Online, but can’t talk much about any of that right now, but will hopefully see something in the near future. DN: Well, traditional is always going to be a great form of art. It’s hand on, emotional, and expressive. Clay, paints, brushes. Theres always something about having that creative tool in your hand that makes you feel good because it feels like your putting more of yourself into the artwork. That said, however, I do prefer digital art. It give me a whole new world of freedom. I can do what I want with digital art, there more tools, more effects, it really helps bring ideas and creations alive in ways traditional art can’t. Don’t worry if you don’t think you can’t draw. Just keep trying. My belief is that anyone can draw, it just takes time. Don’t say you don’t have skill or talent, everyone does. Skill and talent from my point of view isn’t how good you are, but how fast you improve. It’s your learning curve. At the end of they day it’s all down to your own determination to keep practising and sticking with it! TC: Are you currently taking on any comissioned work? DN:Not at this time no. That said, I’m always open for commissions if anyones interested. Just drop me a line. DeviantArt: For DarkNoise’s main portfolio. DevianArt: For Sonic Adventures and other projects.